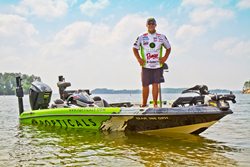 New eyewear company Popticals®, maker of patented compact sports sunglasses, has signed a sponsorship agreement with FLW Tour Pro fisherman Scott Suggs. Scott Suggs has been a full time professional angler since 2004 and currently competes on the FLW Tour circuit and in Major League Selects. With an outstanding career as a professional anger, he is most well-known for making bass fishing history by becoming the sport’s first instant millionaire by winning the 2007 Forrest Wood Cup on Lake Ouachita. In 2015 he became the first Major League Select angler to win a Major League Cup. As part of the partnership Suggs will be representing the new sunglasses company in his Popticals wrapped 2016 Ranger Z520C bass fishing boat while competing in the Fishing League Worldwide Tour and other fishing events across the country this year. Suggs will also be making an appearance this July at the 2016 ICAST show in Orlando, FL where he will be signing autographs and talking with fishing enthusiasts at the Popticals booth. Popticals were created to solve the basic problem with wrap-around sport sunglasses: they aren’t portable. The company invented a solution by creating an innovative, patented design with a rail system that allows the lenses to slide parallel to each other or “spoon” for portable, safe storage on the go. The sunglasses easy expand from their small size to provide sunglasses for those who don’t want to sacrifice portability for quality. Popticals was founded with a spirit for innovation and adventure. The revolutionary design features world-class nylon lenses manufactured by Carl Zeiss Vision. Made in Italy using the best materials and methods, Popticals deliver top-of-the-line sunglasses to outdoor enthusiasts that demand the highest on the quality gear. Popticals ensure fisherman of all levels have high-performance sunglasses when they need them and a protected, compact place to store them when they don’t. The Popticals introductory line will be available at general outdoor and fishing retailers, and can also be found at Popticals.com in 5 frame styles with 25 color and lens combinations.